"What do you think is the best career for Josh?" asked Isha. "Funny that YOU should ask ME," Rosh answered. "Both parents fretting and debating over the potential career choices of their son, who seems to be speeding thoughtlessly and without a care in the world towards oblivion." "You haven't answered me," Isha protested. She did not want another tirade from him. She just wanted an answer. "How would my answer matter anyway," he answered. "He'll follow his muse regardless." "What's so wrong with that?" she asked. 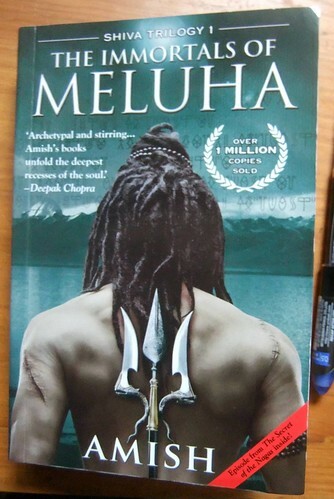 "It led Amish Tripathi to glory." "Amish is a young author that Forbes India has ranked among the Top 100 celebrities in India two years in a row, in 2012 and 2013, and he is younger than you." "His debut fantasy novel The Immortals of Meluha became a surprise bestseller within a week of its publication in early 2010. Now it is available worldwide in 14 languages." "Karan Johar bought its Indian movie rights and Hritik Roshan is going to star in the movie as Lord Shiv. Its international movie rights are still being negotiated through Creative Artists Agency, a Hollywood based agency." She had his attention now. "Since then, he has written The Secret of the Nagas and The Oath of the Vayuputras," she continued, "sequels in the series collectively called The Shiva Trilogy, as they are a work of fiction on the life and adventures of Hindu God Shiv. These have also since been translated in many languages." "With 2 million copies in print and over Rs. 500 million in sales, it is now the fastest selling book series in the history of Indian publishing." "Nothing succeeds like success," Rosh responded. "Josh needs to prepare for his future, even if he is hell-bent on achieving no accolades in his life right now. Just as success is a habit, so is failure. He better not make losing a habit." "Everyone has a destiny," Isha retorted, "and eventually ours finds us. Amish graduated from Indian Institute of Management, Calcutta, but wanted to be a historian. He became a banker and worked in the finance industry for 14 years." "But look where he found fulfillment and glory. Writing historical fiction laced with home-grown philosophy on a mythological character who travels from Tibet to India." "I'd be interested in knowing how he marketed his novel in a market like India," said Rosh. "He agrees," smiled Isha, "that even a good book doesn't sell itself. Despite being rejected by more than 20 publishers, he kept his faith and self-belief, and published it himself. Then he used novel ways of marketing it." Rosh looked at her, listening. "In her article The Lo-Cal Literati," she continued, "Sheela Reddy wrote that weeks before Meluha hit the bookshops, Tripathi printed sample copies of the first chapter and persuaded bookshops and chains to give them away free at the cash counter, creating a buzz." "It was an unprecedented move and gave the book very high visibility, considering that at that time Tripathi was an unknown author. He also made presentations to big retail chains, visited smaller retailers, met local distributors and regularly sent email updates to various stakeholders." "He also used social media sites for promoting his novel, made a trailer film and uploaded it on YouTube." "For promoting his second book, Tripathi created video trailers and screened them at multiplexes like movie trailers before screening of blockbuster movies. These trailers were of similar quality as movie trailers, complete with visual effects. More trailers were released on YouTube." "In 2013, he released a music album called Vayuputras, an original soundtrack based on his third book by artists like Sonu Nigam, Taufiq Qureshi, Palash Sen and Bickram Ghosh . This was the first time ever that an original soundtrack had been made for a book series." "How can you tell me all this," Rosh asked, "and still believe that our destinies find us? Destiny is not discovered. It is a creation. Following your muse will lead to success even if you don't care about succeeding, but only if you have the passion to die for it. I fear my son may not have that zeal." "Trust your genes!" Isha answered with a finality, and busied herself in chores.